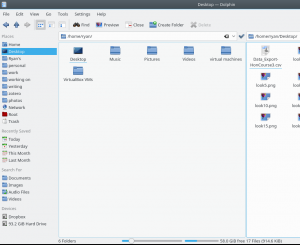 I love how configurable KDE is as a desktop. However, adjusting the look of the desktop is something of a nightmare. 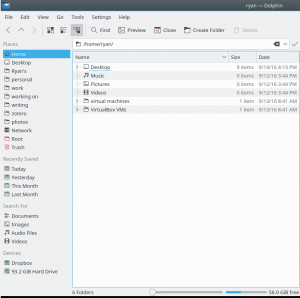 There are five different options to adjust different aspects of the desktop and application windows, each of which does different things, but the labels given to these don’t always reflect what the customizations will be. Here’s my best attempt to explain what each of these does. 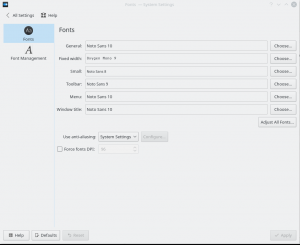 If you click on “Workspace Theme,” you’ll get the following options: “Look And Feel,” “Desktop Theme,” “Cursor Theme,” and “Splash Screen.” Here’s what each of these settings adjusts. 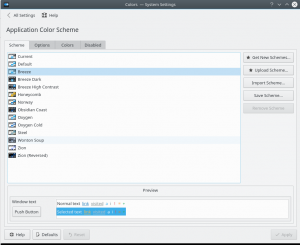 This one-click option for changing the color scheme is nice for simplicity, but it doesn’t allow for detailed customizations of the various aspects of your desktop environment. 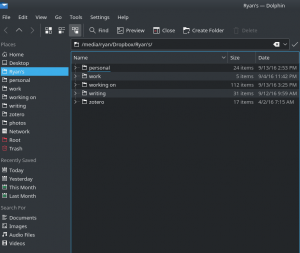 There also isn’t a way to add new options here, which is kind of disappointing as it would be nice to have additional one-click options for changing the entire look and feel of the desktop environment. For now, we’re stuck with two options. 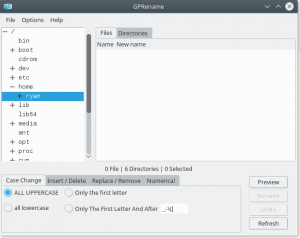 Basically, this allows you to customize the panels and the KDE windows as well as the quick start window (Alt-F2). 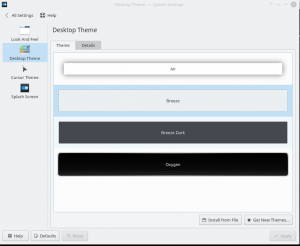 There is the option to “Get New Themes,” which is nice here as there are many to choose from. 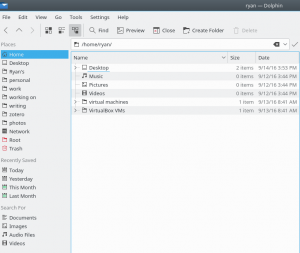 But keep in mind that this is basically just for adjusting themes on the desktop (the panel and those items attached to the panel), but this will not change the color schemes of the applications windows (e.g., Dolphin, or the various other programs). 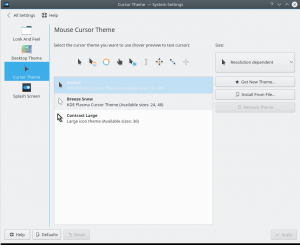 You also have the option of downloading additional cursor themes. 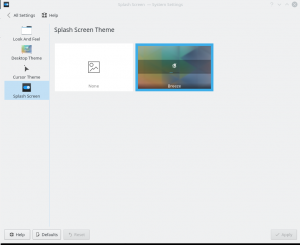 The last option within Workspace Theme settings is the Splash Screen. 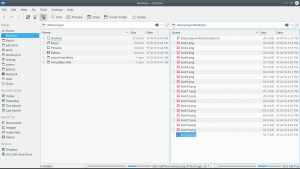 At present, you can either have the Breeze theme or None. Not a lot of options and no way to add additional ones at this point. Granted, this is something you look at while your OS boots, and if your OS boots quickly, what’s the point? But it would be nice to have more than one option here and the ability to add other options. 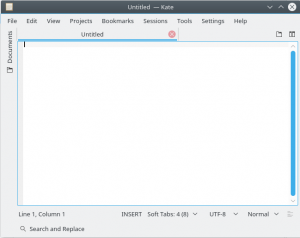 Kate with the Breeze application window theme. Kate with the Obsidian Coast theme. There are three other tabs under the Application Color Scheme: Options, Colors, and Disabled. These allow for more fine tuning of the application windows. 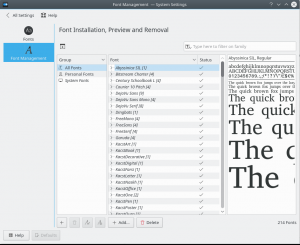 Font is also pretty self-explanatory – here is where you can adjust your fonts. 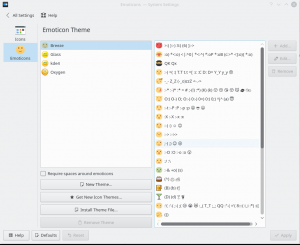 The next set of system options for adjusting the appearance of your desktop environment are for icons and emoticons. 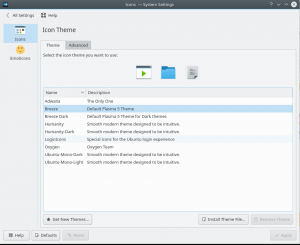 There is the option of installing additional themes for icons as well. 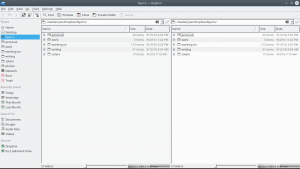 These settings change the icons in Dolphin and in the KDE panel. 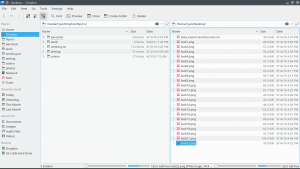 This is another system setting where you can download a whole bunch of additional themes. Also, on the second tab, “Buttons,” you can customize the buttons that appear on each application window. One that I like adding is “Keep above,” as I use that regularly. 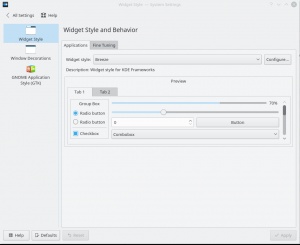 This is another setting that includes the option of downloading additional themes. 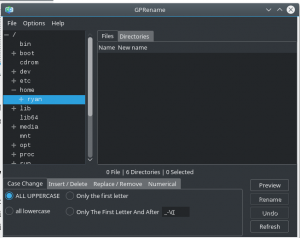 The reason why I put this list together was primarily because there are (1) so many options for customizing your workspace in KDE and (2) the names of the various options aren’t always that intuitive. Hopefully these descriptions will make it easier for you to customize your workspace how you want it in the future. For me, I prefer a darker themed desktop environment as it seems to be a little friendlier on the eyes. The rest of the options are less important to me. 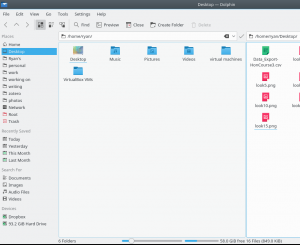 But one of the great advantages of running KDE (and some other Linux desktop environments) is the amazing amount of customizability that is included right out of the box. Have fun modding! 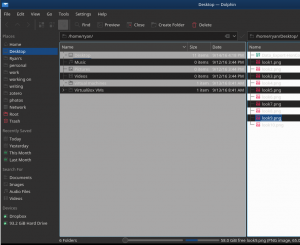 I’m using Breeze Dark on kubuntu 18.04. Is there a way to do something with the active tab on a window? I have three konsole tabs open and it’s very difficult to see which tab is active. I would like it to be highlighted somehow. I didn’t see a setting related to that. 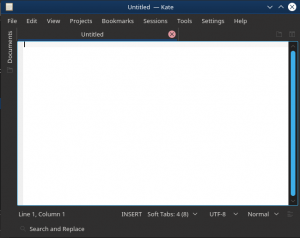 I couldn’t find anything on changing the features of tabs system-wide. However, Konsole, specifically, has the ability to do this using a .css stylesheet. Open Konsole. Click on “Settings -> Configure Konsole.” Inside that window, click on the TabBar tab and about halfway down the window you’ll see “Use user-defined stylesheet.” I don’t know exactly how to set up the stylesheet, but I’m fairly certain that you can adjust the tab settings using that feature.